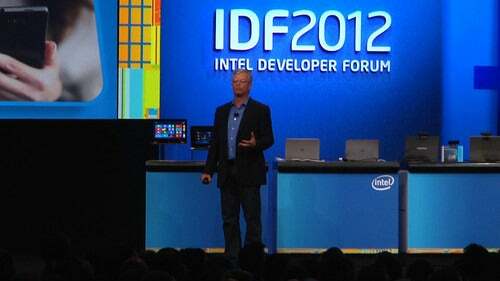 Voice interaction will be available in ultrabooks starting in the fourth quarter, an Intel executive said Tuesday. The feature will allow users to use voice commands to show maps, play music, shop for products and post on social networks like Twitter. It will save users the effort of typing or click through the user interface to do the same thing. The technology is similar to the Siri feature on iPhone, which based on voice commands is able to do simple tasks like play back map locations, schedule a task or play specific songs. But while Apple's service runs via a cloud, Intel and Nuance's voice-interaction features runs natively on the ultrabook platform, Perlmutter. The ultrabooks need a lot of processing power, and the latest Core processors are capable of delivering that performance. This is the latest feature Intel is adding as the company evolves ultrabooks, which started with a staid thin laptop-like design. Some of the latest ultrabooks with Microsoft's upcoming Windows 8 have touch capabilities and detachable touchscreens for tablet functionality. Intel also intends to add gesture recognition, much like the latest gaming consoles. An Intel employee demonstrated the voice interaction capabilities during the keynote. The ultrabook understood a voice command to show pictures in San Francisco and results showed up in a browser via Google search. The demonstration also used voice interaction to show shopping results of an Amazon search for sunglasses. The feature allowed the user to shout a message to post on Twitter. The voice interaction service also responded to a request to play a Hindi song. The voice interaction feature will be able to understand multiple accents within a year, Perlmutter said. The ultrabook chips has been tuned to work with the feature. Intel is bringing more tablet-like features to ultrabooks, and making the devices more flexible to be used as a touch device and also as a high-performance PCs. Perlmutter said that users want more capabilities and with ultrabooks they will get tablet and PC features. More ultrabook form factors will come in the future, and the results will be seen with the fourth-generation of Core processors code-named Haswell, which will be in ultrabooks next year. Haswell was designed with mobile devices in mind, and will offer better performance and graphics while drawing less power than older Core processors, Perlmutter said. Perlmutter hammered home Intel's focus on mobility. Intel is trying to maintain its dominance in the slowing PC market, while catching up with ARM in smartphones and tablets. While ARM rules tablets and smartphones, Intel hopes to disrupt the tablet market with ultrabooks. "We don't have to be confined to a specific form factor," Perlmutter said. "People want a variety of usage."